Reprints! I may as well call this the zombie list for all that they’re celebrated, but celebrated they should be. I am always truly delighted when a picture book rises from the out-of-print dead to engage and delight young readers once more. Steadily throughout the year I’ve kept track of some of the brighter stars in the reprint firmament. Consider this a continuation of yesterday’s Caldenott list, only worse. At least 2017 Caldenott books can appear on New York Times Best Illustrated or Boston Globe-Horn Book lists. Poor reprints had their day in the sun already, and are too too easily forgotten. A glass is lifted then to the ones that get a second shot at life! The Pettson and Findus books, imports from Sweden, were originally published in the states a little less than a decade ago. If you have the book Findus Goes Camping on your library shelves then congrats! You already own this book. However, if you do not have any Findus books then you are in for a treat. Yes, they’re a bit on the long side, and a bit on the wordy side, but they are also a bit on the charming side and I like to think that more than makes up for their wordy longness. Plus nobody draws a cat like Nordqvist. Nobody. You might well wonder if this book ever actually went out of print, for all that I’m lauding its reprint today. Long story short, I have no idea. Maybe? Galdone’s a bit of a staple in my household. He sort of cornered the market on songs, fairy tales, nursery rhymes, etc. in bright, colorful, accessible picture book formats. For the librarians out there doing storytimes, the reprint of this particular book is to be celebrated. It’s no coincidence that Burton’s train book comes out the same year as the picture book biography of her penned by Sherri Duskey Brinker, and illustrated by John Rocco. Far better known for her Mike Mulligan and Little House tales, I read Choo Choo to my three-year-old with interest. The story breaks down to talk about an engine full of narcissism and self-importance who takes a fateful journey (mucking up pretty much everyone’s day) and learns her lesson in humility. And it works! The sound effects are fun, the action moves at a clip, and it can sustain the interest of young readers. I wouldn’t read it aloud to a group but one-on-one it works. Years ago when I was working at New York Public Library I helped Leonard Marcus as he prepared for what would eventually become the children’s book exhibit The ABC of It. Sorting through the extensive children’s book reference collection we stumbled across several copies of this charming little French import from 1967. So you can imagine my sheer delight when I discovered that the publisher Enchanted Lion was bringing it to life again, translated and with the original little case still intact. I love picture books that push the boundaries in terms of format, size, and packaging. This book is a little treasure. On these 31 Days, 31 Lists I do tend to highlight books that have made the leap into new formats. Picture books that have turned into board books are a good example of that. This book, however, may be the only book I’m mentioning because it goes from picture book into an easy book format instead. The transition is smooth and seamless. So much so that you may find yourself forgetting that it was ever a picture book in the first place. Sometime in the coming week I will be posting an interview I conducted with editor Frances Gilbert about the re-release of the Hobans’ classic. For those of you familiar with the story primarily through the Jim Henson television holiday special, I think you’ll be pleasantly surprised by how much of the story has remained the same. The big exception being the look of the Riverbottom Nightmare Band. But definitely add this to you Christmas classics shelf (unless you already own the original, of course). This book. I came so very close to reviewing it this year, and I almost never review reprinted picture books. But in the times in which we live I think this is the book of 2017. 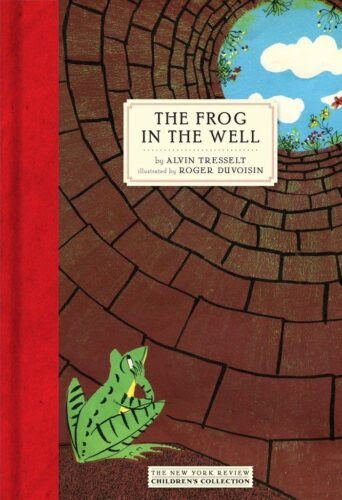 It’s all about a frog that thinks its well is the hole world. When circumstances force it to flee the well it discovers that there’s a whole world out there. Then, when the opportunity arises to return to the well, it opts instead to use the knowledge it has gained and join with fellow frogs. Metaphor anyone? Oh, they’ve been reprinting all the old Joyce picture books this year. I’m sure we all have our favorites, but for me it begins and ends with old George here. And when we are all dust in the ground and our names simply letters on a page, I think this will be the book Joyce is best remembered for. Again, we’re getting into was-it-ever-really-out-of-print territory, and it’s a funny book anyway. Based on an animated short, it seems to bear more in common with, say, a Mo Willems text than a Seussian one. But you’d have to be pretty hard of heart and souled of steel (not a phrase) not to have some love for Gerald, here. A delightful reprint and one I’d never really encountered before. The story follows a girl to her attic where she uncovers a hat with magical abilities. This is one of those cases where the limited color palette actually is a good thing. You’re both thrilled by the girl’s adventure and oddly unnerved by it. As far as I’m concerned, any way you can find to package, repackage, over-package, and generally make available the Gossie and Gertie books is a-okay with me. I couldn’t believe it. Back around Halloween I linked to an old 2010 blog post talking all about this book, and then I discover after the fact that it has actually been reprinted this very year! How weird is that? This looks absolutely creep-tastic. The kind of thing people read as children and then remember for the rest of their lives. They just don’t make ’em like THIS anymore! Extra points for the fact that the publisher is “Feral House”. Kalman’s another author that they reprinted this year, and I’d argue that some of her picture books appeal more to adults than kids. Of the ones released this year I’d have to say that this may be my favorite. Plus it contains the little blue guy featured in the 100 Scope Notes post Dear Barnes & Noble (And Everyone): What Is This? A double threat! Not only did this book win a Caldecott Honor back in the day (which is to say 1958) but it’s bilingual to boot! Someone should go out there and count how many Caldecott winners have been bilingual. I suspect the number is not particularly high. How lovely to see this one coming back then. Do you find this frightening? Me too. Enticing? Me too. Does it live up to expectations? It does. Should you buy it? You should. And for the record, I believe that there’s a Spanish edition of this book available as well (though it currently looks to be Out of Stock). A Polish picture book from the 1930s is not the first thing that comes to mind when you consider potential reprints, but what a beauty. I’ve seen a couple Soviet-era and Eastern bloc picture books come out in 2017 but none of them, to my mind, holds a candle in terms of kid-appeal to this beauty. Three poem-stories make up the book and the modernist art is really the best. So nice to see it here. Full points not only to the book being published in the first place back in 2005, by Candlewick, but for them bringing it BACK twelve years later. This is basically Brave New World for kids. Think about it. You know that I’m right. The most charming reprint on this list. I’ve always loved Bodecker because of his art for the Edward Eager books, but here he’s allowed a little color as well and the result is magic. I’m having a hard time not just reusing the world “charm” over and over here. It’s what you’d get if Edward Gorey went 100% sweetness and light on you. We see a lot of different versions of the original Moore poem come out but I want to hat tip Caparo’s vision. First off, I’m as anti-smoking as the rest of you, but I also cannot stand it when books change Moore’s words. Here, Santa has a pipe clenched in his teeth and it is FINE. He also wears sneakers. This is also fine. Good on all accounts. DePaola’s backlist was also plundered in 2017. But of the books that have come out, perhaps none have meant more to people than Oliver Button. The original Sparkle Boy, DePaola was knocking down gender stereotypes before it was cool. It holds up. It really does. Oh, I LOVED this! And I knew next to nothing about Ms. Ayer prior to its publication. Head over to Brain Pickings to get the backstory on the book and the creator and then snap this up. Originally from 1962, you could honestly release this today and no one would guess it was that old. There’s something remarkably modern about the art and the writing. Oh, I missed this the first time it was released! I worry sometimes that Fred Marcellino is going to be forgotten. It’s not a crazy thing to fret about. I mean, during his time he was the king, but since his death we don’t stop to remark on how good he was as often as we could. Plus I just love Lear so kudos there! This is a remarkable piece of history and nonfiction. I just can’t figure out why it took this long to reprint it. Lee & Low are bringing it out for its 40th anniversary, and it should be required reading in every North American school. Read the copy for it on the Lee & Low site for more information. You’d be forgiven if you saw this book come out this year and thought it was a 2017 publication. Originally released in 2017, it’s only now getting a proper push in the right direction, with folks left, right, and center fawning over it. The sheer diversity of hair types and styles is rare in a picture book. Rarer still are dark-skinned princesses. Noteworthy. Because you can never have too many penguins. Oops! Thanks to Laurel Snyder for reminding me about this one. I almost forgot to include it, and it really is a classic. Not a lot of Jewish children’s books get reprinted in a given year. If you had to pick one to redo, it would probably be this one. Tell Me a Mitzi is the 2017 reprint that made me happy. I loved this book so much as a kid! It’s a reprint?! I have it on a different list but I’ll add it here pronto. I loved that book! I think so!! I’m pretty sure it was out of print. Yep, you’re completely correct. It was originally released in 1977. Missed that. Thanks! My original copy of Miss Jaster’s Garden is right here on my bookshelf-my favorite picture book from childhood! Love that little hedgehog and the details of the house and town. Beautiful. Lots of interesting books I haven’t heard of before. Typo note—it says Princess Hair was originally released in 2017 which I’m assuming isn’t right! Nope. It was originally released in 2014. I’m excited to check out so many of these! Strangely, the NYPL only has If Apples Had Teeth in Spanish. You missed “Hi, Pizza Man!” back in print from Purple House Press. ACK! That was this year, wasn’t it? What the friggin’ heck . . . Okay. I’ll add that tonight. Sheesh! Big great gaping gaps are in this particular list . . . Yes! Tell Me a Mitzi!